This was a pretty slow week. Several genre shows are on hiatus until after the Olympics. Caprica took one week off. 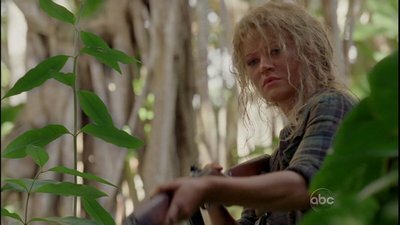 Not terribly much happened on Lost until the final minute when Claire returned. The cast is out looking for new jobs with Daniel Dae Kim getting the lead role in a Hawaii 5-0 remake. 24 has been disappointing this season with rumors that this might be the last season on television, to be followed by a movie. This gives them two choices–remain in real time and have a two hour story or compress the events of twenty-four hours into a two hour movie. The word is that they are considering the compressed day idea. There have been a few genre oriented posts out already this week, two involving Captain America. First there was a look at Captain America vs. The Teabaggers which actually is seen in the comic. This was followed by a look at Captain America vs. Iron Man and the Superhuman Registration Act. We’re partnering to promote education. We’re expanding exchange programs and pursuing new opportunities for online learning, connecting students in America with those in Qatar and other Muslim communities. Because knowledge is the currency of the 21st century, and countries that educate their children-including their daughters-are more likely to prosper. We’re partnering to broaden economic development. We’re working to ensure that the global economic recovery creates jobs and prosperity in all regions of the world. And to help foster innovation and job-creation, I’ll host a Summit on Entrepreneurship in April with business leaders and entrepreneurs from Muslim communities around the world. We’re partnering to increase collaboration on science and technology. We’ve launched a Global Technology and Innovation Fund that will invest in technological development across the Middle East, Africa and Asia. And the first of our distinguished Science Envoys have begun visiting countries to deepen science and technology cooperation over the long-term. And we’re partnering to promote global health. We worked together to address H1N1, which was a concern of many Muslims during the hajj. We’ve joined with the Organization of the Islamic Conference to eradicate polio. And as part of our increased commitment to foreign assistance, we’ve launched major initiatives to promote global health and food security around the world. For a decade, our relationship was framed by trauma and terrorism, by two ongoing wars and political conflict—and the fallout only polarized us further. Many Muslims perceived the United States as an aggressor – projecting its power solely to protect its own security and economic interests, usually at the expense of Muslim countries. Too many in western societies implicitly, and at times explicitly, blamed an entire religion for the unholy violence of a few. This left many Muslims angry and alienated and complicated the task for leaders in the region. First, America is striving to think and talk differently about Islam. We reject—publicly and categorically—the demonization of a religion and recognize our need for deeper understanding. Our values and our history remind us constantly that religious bigotry – whether it is anti-Semitism or Islamophobia – has no place in our public life. America was founded by those seeking freedom of religion, and all Western countries need to recognize that banning burqas or minarets is contrary to our shared values. It builds unnecessary walls between Muslims and the rest of society. It’s insulting, and it only exacerbates tensions. Readers of this blog have undoubtedly picked up on the fact that two television shows I like are Big Bang Theory and Gilmore Girls. An old post on the possibility of a Gilmore Girls movie has by far the longest running thread of comments which has continued into this year. One concern I’ve had is whether the old sets are available. It just would not work to have a Gilmore Girls reunion without Stars Hollow. Remember how disappointing it was to have the Cheers reunion without the old bar? It turns out not only does the Stars Hollow set still exist (picture above) but that there is a connection between this and Bill Prady, executive producer of Big Bang Theory. 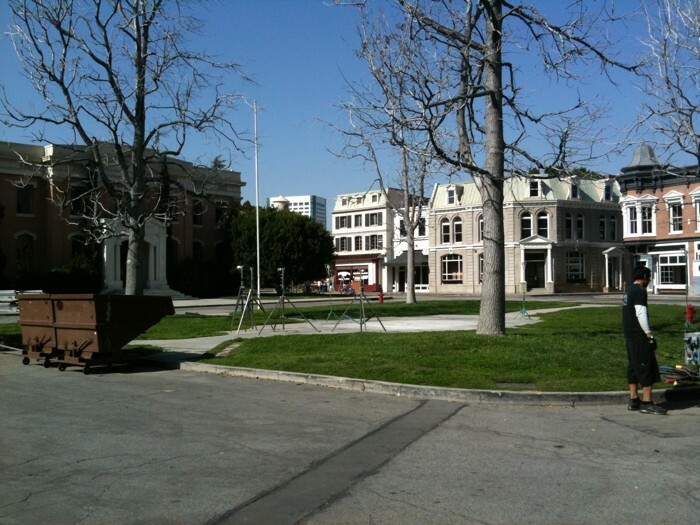 Bill Prady has a tweet saying, “The walk from my office to the stage is through the Warner back lot (Star’s Hollow)” He linked to the picture above. That would be a great walk to take on the way to work everyday, and even better if Lorelei and Rory would walk by with their rapid-paced dialogue. On Friday I opened a Twitter account. White House Press Secretary Robert Gibbs started one on Saturday. By Saturday evening when I was breaking thirty followers Gibbs was breaking ten thousand. He is PressSec if anyone is interested and hasn’t come across word of this yet. Additional responses and tweets about PressSec can be found here. If anyone is looking for a job, the Democratic National Committee is also looking for someone to take over their postings on Twitter, Facebook, and MySpace.